Nakasero, one of the most prestigious hills in Kampala, resembles a tapestry split down the middle by two distinct colors. The opposing colors fuse together, forming fascinating and hard to define patterns. 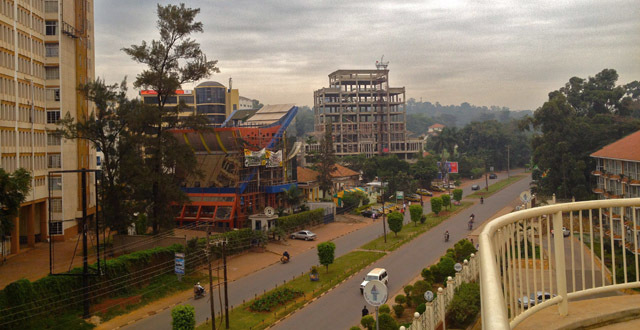 The south side encompasses Kampala’s bustling central business district and has long been full of old high-rises and hubs of Kampala business. Nakasero Market, a famously huge and hectic outdoor market caps the south side of Nakasero. Conversely the quiet north side of Nakasero is separated from posh Kololo by the Kitante Golf Course and is generally the peaceful lap of luxury, expensive real estate and global cuisine. The north side was historically residential but is becoming more diverse as commercial real estate has slowly integrated, fueled by the construction boom over the last ten years. Although substantial areas of private residence are still available, some of the large, elite houses have been replaced by modern high-rises. The Business District’s prestigious inhabitants include the Uganda Parliament Buildings, The Kampala State House, many embassies and the headquarters of most Ugandan banks and businesses. The difference between the two sides of Nakasero is epitomized in the difference between the two bookends: Kitante Golf Course and Nakasero Market. Right in the middle of the fusion there is much to explore! Most residential real estate in Nakasero can be found on the north side. Prices rival those of upscale Kololo. Mid range, furnished apartments run around $1,500 to $2,000 per month and unfurnished houses cost around $3,000 and $6,000 per month (if you can find one!). If you’re hoping to buy a home, Nakasero boasts spacious beautiful houses, with lush yards and plenty of privacy. Again, good luck finding one for sale! If you want to live a bit more connected to the urban texture of Nakasero, the apartment high-rises provide beautiful views of Kampala’s rippling city skyline and/or the Kitante Golf Course. Nakasero has a wide variety of hotels from luxury to business to economical accommodations. You can choose to stay in the bustling city or near the quiet Kitante Golf Course. Wherever you choose to stay in Nakasero you’ll be in the heart of Kampala and you’re bound to enjoy your experience. Mosa Courts Apartments – Luxury apartments, beautifully furnished with all amenities. Available for short or long-term stays. The complex contains a gym, swimming pool, sauna, steam baths and a beauty parlor. Monthly rate is $2,000+ depending on room type. Short-term stays cost between $170 and $300 per night. Hillview Apartments – Furnished apartments, with all amenities, ranging from 1-3 bedrooms. Health club, gym, steam room and sauna available. Monthly rates range from $1,500 to $2,000 and daily rates range from $95 to $200. Golden Leaves Apartments – Stylishly furnished apartments, with all amenities, range from one to three bedrooms. One of the perks of Golden Leaves is access to The Sheraton Kampala Hotel’s health club, sauna, gymnasium, tennis court and squash courts. Prices range from $3,100-3,800 per month. Prestige Apartments – A more urban setting, these chic city apartments are in the heart of central Kampala. Furnished with all amenities and access to swimming pool and gymnasium. Call for rates, economical daily prices are available for short-term stays. Speke – Located in the heart of Kampala, you’ll have access to everything from the Speke. The Hotel was built in the 1920’s and has a beautiful colonial era ambiance. There’s a pool and Indian and Italian restaurants. Single and Double rooms are $110 per night, breakfast included. Emin Pasha – Boutique hotel. The restaurant, spa, bar and garden are all of superior quality and provide a unique experience. The service is excellent and the ambiance is enchanting and peaceful. The perfect place for R&R. The starting price is $145 per night. Serena Hotel – The Serena Hotel once famously housed Queen Elizabeth II of the United Kingdom and maintains its class and elegance today. A beautiful, modern hotel with an amazing pool. The whole grounds have a luxury, tropical energy with dozens of peaceful nooks to sit and relax. It is hands-down the top hotel in Kampala. Sheraton – Located in the heart of the city the Sheraton has a commercial, urban feel. It’s a luxury, relaxing retreat and prices start at $150 per night. Fairway Hotel – Located on the North side of the hill, the Fairway hotel has views of the golf course and Kololo Hill. It’s a quieter atmosphere and has close access to shopping at Garden City and Nakumatt Oasis as well as many upscale restaurants. Mamba Point Guesthouse – A beautiful guesthouse in a safe location that’s still close to the action. Mamba Point Guesthouse has only six rooms and offers very personal service. Rooms cost $150 per night and include breakfast! New City Annex – Some of the most economical lodging in Kampala. The walls are thin and it’s nothing fancy but it’s reliable and located in the heart of downtown. The best part is that it costs about $15 a night! Holiday Express Hotel – Budget hotel on the corner of Luwum and Dustur streets, opposite Nakasero market. Single rooms start at $45 per night. The shopping in Nakasero maintains the polarity of the rest of the hill. On the north side, sandwiched in-between Nakasero and Kololo, you can find two organized shopping malls right next to one another, Garden City and Nakumat Oasis. On the south side of the hill, on Old Kampala Road, Nakasero Market has the exact opposite feel and is famous for being incredibly hectic. The Market is located on the upper side of the Taxi Park, which is like a wildly chaotic central bus station, except “the buses” are 12-passenger vans called “taxis” or “matatus.” Nakasero Market has a huge vegetable and fruit section and extends into an old warehouse, which sells general conveniences. Garden City – Uchumi Grocery Store is the anchor tenant. Great food court on the second level with an open view of the golf course and lots of fresh air. Variety of stores, a casino, a movie theater, a bookstore, cafes and an ice cream parlour. Access to banks and ATMs. Oasis Mall – Nakumatt has everything – groceries, household supplies and appliances, books, mattresses, electronics and more. Great clothing stores, including South African retail chain, Mr. Price. Access to banks and ATMS. Nakasero Market – Textiles, shoes and cheap electronics are sold inside of a large Old Kampala warehouse, at the foot of Nakasero Hill. The market then spills into a large outdoor section that sells heaps of fresh local produce. The market is always the cheapest option for grocery shopping. The produce isn’t made with lots of chemicals and especially with all of Kampala’s power outages your fruit and veggies won’t last long. Plan to stop by every other day if you’re planning to fill your kitchen with goodies from the market. Nakasero has an interesting array of sites to see and entertainment to discover. Most nightlife is confined to the hotels with a few exceptions like Lotus Mexicana restaurant, which has exciting events, such as salsa dancing and Brazilian capoeira classes scheduled throughout the week. The beautiful Kampala Hindu Temple is a site to see on the skyline of Nakasero, especially when lit up at night. It’s worth visiting for it’s ornate beauty, and is rumoured to serve free community dinners of delicious Indian food on Saturdays. There is a wide variety of cuisine in Nakasero, but a narrower margin of prices – most of the restaurants are fairly upscale. The menus are eclectic and delicious. Italian food at Mamba Point is one excellent choice for dining in Nakasero – not to be confused with Mamba Point Pizzeria (also excellent) that is just a three-minute drive down the road. Thanks to the influence of many Italian immigrants over the years, Uganda has exceptionally good Italian food. Other options include local cuisine, Korean, Chinese, Japanese and Mexican. Mamba Point – Romantic, cellar-like dining room and garden terrace. Dine on superior Italian food while surrounded by exotic plants. There is also a private dining room available for booking if you desire to hold a meeting or event at Mamba Point. Mamba Point Pizzeria – Secluded open-air dining, open-air seating under a thatched roof provides a peaceful experience for lunch or dinner. The thin-crust Italian pizza is delicious! Arirang – Korean/Chinese cuisine. A huge plethora of Asian comfort food is available here. This is a massive restaurant with a lot of seating options. The food is good and a bit pricey. It’s a fun dining experience. Fez Brasserie and Wine Bar (Emin Pasha Hotel) – Pan-African and Pan-Asian seasonal menu, which utilizes local produce and ingredients. Serene and romantic with indoor/outdoor and terrace seating. An extensive and well-staffed wine bar, delicious food. Yujo – Delicious Japanese food and sushi. Great service, pricey, low Japanese tables with cutouts for your legs underneath (is this cheating?). Open air, covered dining rooms and a beautiful bar. The Lakes Restaurant (Serena Hotel) – Has indoor and terrace seating, serving breakfast and lunch buffets and dinner a la carte. It’s a nice place to sit and enjoy desert, coffee and tea. Excellent ice cream bar is adjacent. Don’t miss out on the Seafood Night… the best one in Kampala! The Explorers Italian Bistro (Serena Hotel) – Italian food in a warm and rustic lounge inspired by a safari lodge. Pearl of Africa (Serena Hotel) – This is the most expensive and highest-end restaurant located within the hotel. Its elegant dining room and terrace have views of the gardens and fountains outside. The menu has international, pan-African and Ugandan cuisine. There is romantic, live piano music every night. Wine and a full course dinner for two will likely cost just over $100 (250,000 UGX). Lotus – Lotus Mexican restaurant caters to a wide variety of pallets and has a menu of traditional Mexican dishes and desserts as well as a typical Ugandan menu. There is outdoor garden seating and a fun indoor dinging room. Lotus also has salsa lessons and Brazilian capoeira classes. Check their Facebook page for schedules. Fang Fang – Good Chinese food! Two locations: One is in Uganda Communications House and the other is a hotel/restaurant found near Lotus. Both have nice environments. Great for large gatherings as there are private seating areas. Bhagwatt Restaurant – A cheap, fun option downtown. A small vegetarian (vegan is possible) restaurant overlooking Nakasero Market Square. Good meals for 7,000 UGX. Soho Cafe – My favourite cafe in the area, the large outdoor covered seating provides plenty of light usually accompanied with a soft breeze. Free wifi, friendly service, and a nice indoor seating area as well. This quiet cafe provides a calming atmosphere for lunch and working through the afternoon. Cafe Pap – This cafe in the Business District of Nakasero has the exact opposite feel. Nestled amidst the bustling businesses, Cafe Pap is partitioned from the traffic by a wall of plants, but you can still feel the city pleasantly humming around you. It’s a great spot to grab a coffee or meal in the middle of a busy day. Nightlife in Nakasero is pretty posh. Emin Pasha is a great place to get dressed up for a date or just lounge. The Serena, Speke and Sheraton hotel have nice bars as well. This isn’t the place to hang out at local pubs, which can be nice. You can count on cold beers and higher prices. The Emin Pasha Hotel – A cozy boutique hotel with luxury accommodations. There is an extensive wine bar and live jazz from 8pm – 11pm every Friday night. The music is always good and the atmosphere is dreamy on the lawn while candlelit patio tables are perfect for conversation. In the Mist (Serena Hotel) – This place looks out over a beautiful garden area with a pond. Named in reference to the film “Gorillas in the Mist”, the bar view is intended to evoke thoughts of Uganda’s famous gorillas in their tropical habitat. There is also a pool bar, perfect for lazy afternoons! Don’t forget we’re on the equator… even if you typically “never burn” sunscreen is essential. Don’t wait until your skin looks like bacon! Equator Bar (Sheraton) – This bar, adjacent to the lobby of the Sheraton, overlooks the gardens and occasionally has live music. It’s one of the high-class hangouts of Ugandan corporates. The Kyoga Pool Bar is another relaxing afternoon destination. Nakasero Hospital – This on Akii-Bua Road is one of the top hospitals in Uganda and offers outpatient and inpatient care. Jessica, this is such a cool thing you are writing and providing for us? where do you ‘lowly intern’? Me, I work at USAID, kinda dull bureaucrat. Jessica, do you ever get in on any particularly promising parties…? I mean i know mishmash, and like it, and am just starting to make sum friends here, but it’d be nice if there mite be more social, at-home engagements…? or is that just not the way it’s done here…anyway, maybe i’ll meet you sometime…i go to mishmash often on movie night, and with Kampala’s only, i think, chocolate labrador retriever, who they like there, named Zeus. Thanks for these reviews. I’m a frequent visitor to Kampala for work – and your reviews have helped me with food and hotels!